“Sources” told WPXI and KDKA on Friday that Antwon Rose Jr. was caught on video firing a weapon out of a moving vehicle shortly before he was shot in the back and killed by an East Pittsburgh police officer on Tuesday. “Sources” also told the two Pittsburgh area TV stations that firearm residue was found on his hands. 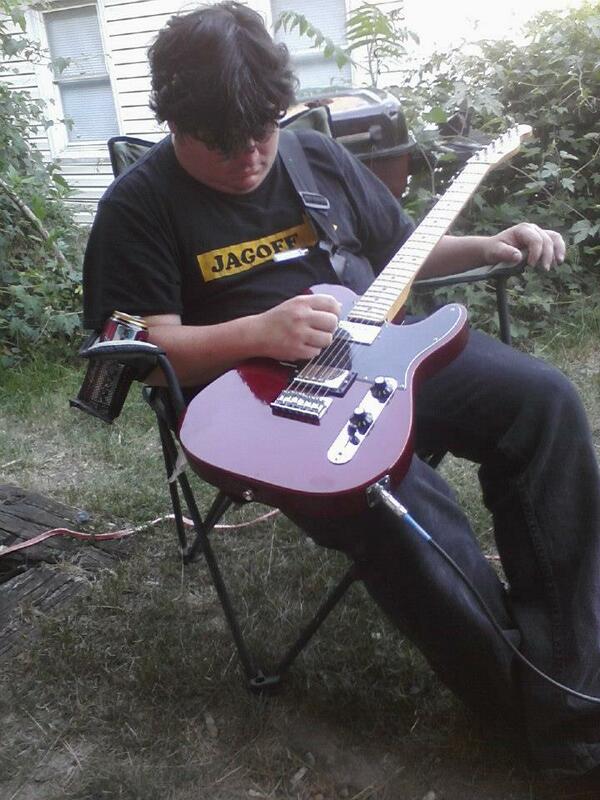 Those sources, according to statements made by the Allegheny County Police Department conducting the investigation into the 17 year old boy’s killing, turned out to be false. So either the unnamed “sources” or the Allegheny County Police department were lying, obviously. Logic would dictate that county police departments who are investigating a municipal police officer for a homicide would have no incentive to lie to protect the victim if he had committed a drive-by shooting a shortly before being killed. But logic, apparently, doesn’t rile up the racist portion of the Western Pennsylvania viewer base. The NBC affiliate owned by Cox Media, WPXI, tweeted out their first false report at 2:27pm, followed by retweets of retweets of the same story by individual reporters. The CBS affiliate, KDKA, tweeted out their first false report at 2:51 pm. At 3:23pm KDKA tweeted the false report again, this time acknowledging Allegheny County Police deny the report. Minutes later, at 3:31pm, yet another tweet, still hold on to the validity of the mysterious “sources”, apparently no one asking why the county police would lie. 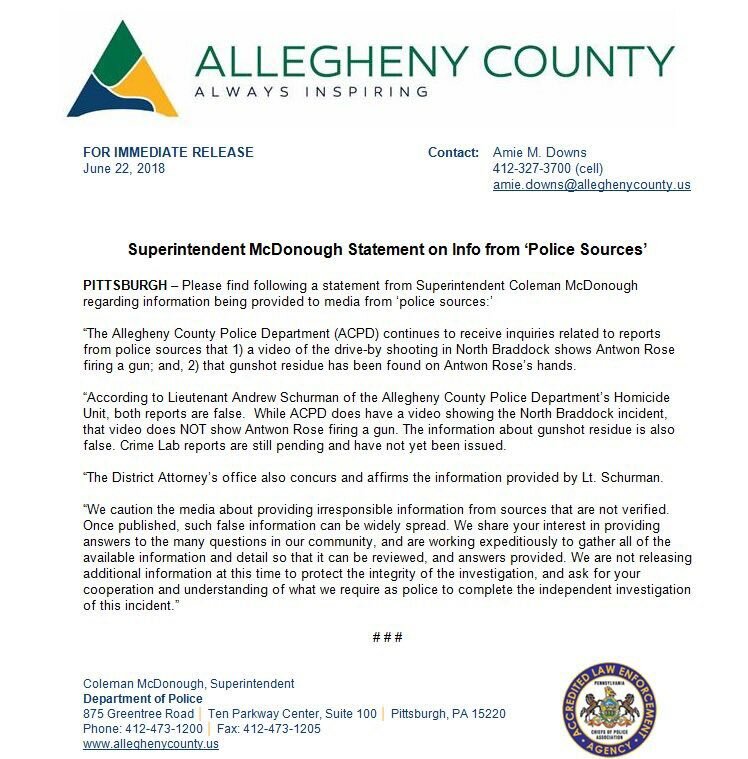 The full statement is here… It flatly denied the reports about Antwon Rose being the drive-by shooter, and also the report about residue being discovered on his hands at the scene, and further went on to reprimand to media for what was clearly “fake news” reporting. We caution the media about providing irresponsible information from sources that are not verified. Once published, such false information can be widely spread. We share your interest in providing answers to the many questions in our community, and are working expeditiously to gather all of the available information and detail so that it can be reviewed, and answers provided. We are not releasing additional information at this time to protect the integrity of the investigation, and ask for your cooperation and understanding of what we require as police to complete the independent investigation of this incident. Despite this, at 4:33pm KDKA reporter Jon Delano tweeted out a tease for his 5 o’clock report indicating that he’d run it as a “both sides” story. Then three minutes later, KDKA once AGAIN tweeted about the story WITHOUT MENTIONING THE STATEMENT FROM ALLEGHENY CO PD. WPXI was more egregious. They kept their original tweet and retweets up, and never once on their Twitter account posted anything about the statement from Allegheny County. After multiple tweets asking why, I got the attention of reporter Aaron Martin. In their 6 o’clock evening news David Johnson only referred to the statement in a two second throw away line about the DA denying the reports.